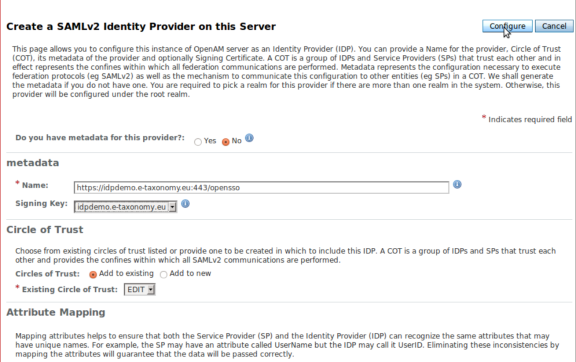 This topic provides an example of how to configure SAML v2 SSO with Activator as the Service Provider (SP) and Forgerock OpenAM as the Identity Provider (IdP). Configure the Activator UI connection to support HTTPS. Import the OpenAM IdP certificate. Configure the SSO SAML fields. Be sure to map the user attributes that are used to identify the user at sign on. You will use this URL to import the Activator connection information to OpenAM. Install and set up OpenAM. Configure Activator as an SSO Service Provider. Log in to OpenAM using OpenAM administrator credentials. On the Common Tasks tab, click Create Hosted Identity Provider to open the configuration page. In the Metadata section /Signing key field, select a key from the drop-down list. For detailed information, see Manage certificates and keys. In the Circle of Trust section, add this IdP to the Circle of Trust. In the Attribute Mapping section map attributes. See Map attributes. Click Configure to create the provider. Login to OpenAM using OpenAM administrator credentials. 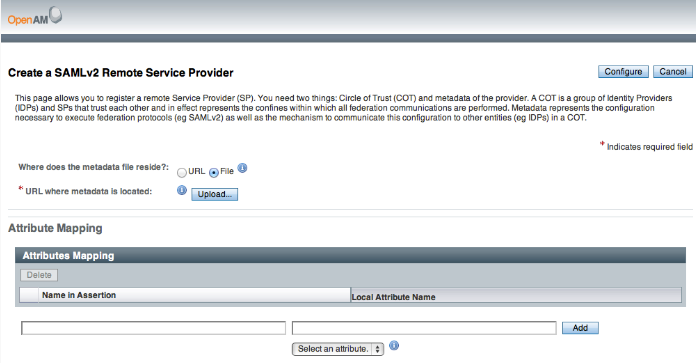 On the Common Tasks tab, click Register Remote Service Provider to open the Create a SAML v2 Remote Service Provider page. For the Where does the Metadata File Reside? option, select URL. Complete the attributes fields. See detailed attribute information, see Map attributes. From the top menu, select Add realm. Enter the realm name= name of realm (for example, axway). From the top menu, open the Client. Click Save. The Settings tab of the newly created client is displayed. Enter the following values under the Settings tab. Note For any settings not mentioned below, use the default. From the Mappers tab, select Add Builtin . From the Mappers tab, select Create to add a new mapper. From the top menu, go to the Realm Settings screen. Under the Certificate column, click on View. The encoded certificate is displayed. Copy the encoded text to the clipboard. Create a text file, ipcert.txt. Paste the encoded text from the clipboard. Save this to your local system. Log on to Activator as an administrator and go to System Management > Configure UI connection. Select Add a certificate and generate or import a personal certificate to use for TLS. Go to the Personal certificates tab of Configure UI connection page and export the public key of the added certificate in a DER format (.cer extension). Under Circle of Trust Configuration add the newly created Activator SP entity to the Circle of Trust. On the Common Tasks tab, click Create Hosted Identity Provider . In the Metadata section, select the Activator signing key from the list of available keys in the Signing Key drop-down list. The name of the IdP public certificate is "PrivateKeyEntry". This command exports PrivavteKeyEntry to the file cert_file. Place a copy of the exported certificate in a directory on the Activator machine. Select the Identity Provider Certificates tab. Click Add an identity provider certificate. Confirm that Import a certificate from a file is selected and click Next. Browse to the location of the OpenAM PrivateKeyEntry certificate on your local file system, select it, and click Next. View the certificate details and click Finish. Each of these can be retrieved from either the <saml2:Subject> element or from a specific assertion <saml2:Attribute>. To configure authentication by user attributes you must define them in both openAM an in Activator. The attribute information must be identical in each application. Go to the Host Identity Provider configuration page. Log in to Activator using Activator administrator credentials. 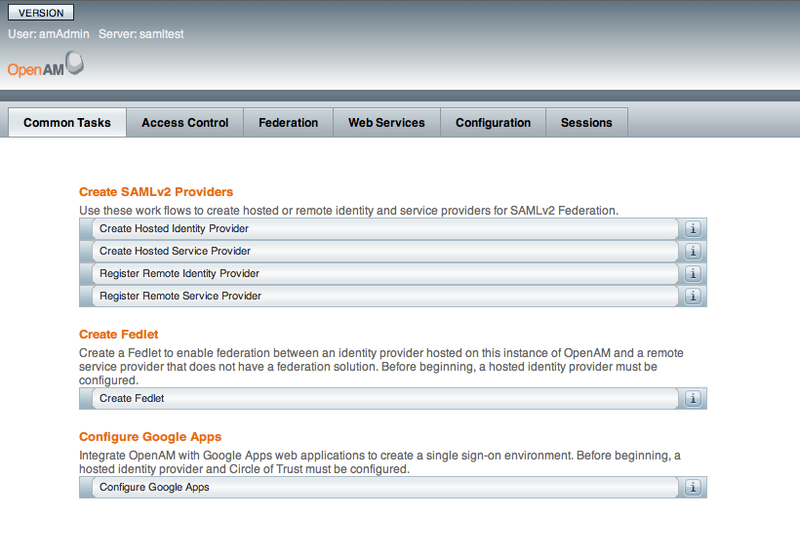 Go to System Management > Configure UI connection, and from the General tab, click SAML Configuration to open the SSO SAML configuration details page. Select the User attributes tab. For each of the three attributes, select the option Assertion from attribute, and enter precisely the same Assertion attribute name and Assertion attribute friendly name that you defined in OpenAM.